Meet Jo Gail. She's my niece and a little 'mini me'. She loves to bake. And craft. And dress up. And wear sparkle-y things. She can make me smile on the worst of days. Gosh I love her! These photos are from our trip to Louisinia back in April. We stopped and had dinner with her, her sister Grace and their parents. 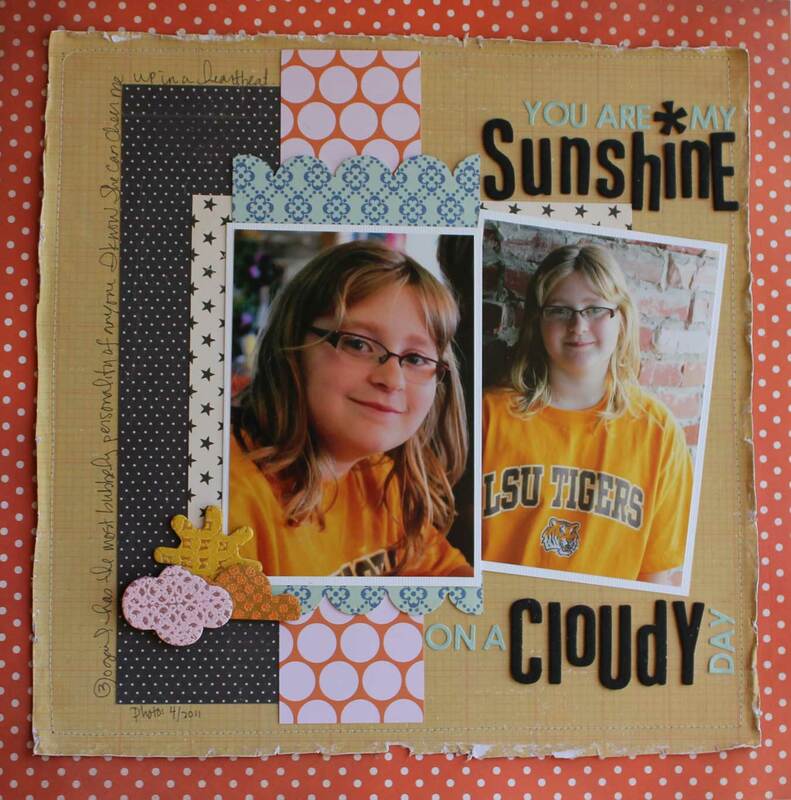 I used my Studio Calico Lawn Party kit on this page. Love the colors. This kit just keeps giving and giving, LOL. I bet I will have 12 layouts from it before I am all done. Gotta love the bang for your buck effect of the Studio Calico kits! Of course, I bought one add on and then had several pieces from the other addons already in my stash, so I had a bunch to work with! Making this page was a breeze. Heck, I even drug out my sewing machine and added a little stitched border around the edge. For the clouds, I used my Martha Stewart stamps and American Craft embossing powers to heat emboss a pattern on the chipboard. I love the effect - subtle, but definately noticeable. John is leaving for Cub Scout camp today...we have been trying to get him all packed. I would be lying if I said I wasn't worried about him. It is to be 110 degrees this weekend and he isn't the best about drinking water and adding sunscreen. Oh, well. He will either do it or get a real life lesson!